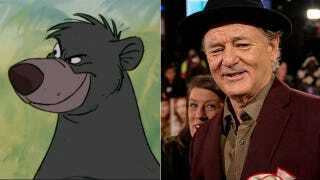 Today in perfect casting decisions: Bill Murray has been selected to provide the voice of Baloo the bear in Disney's remake of The Jungle Book. Disney's adaptation is being directed by Jon Favreau, and will feature a combination of live action and CGI. (The other Jungle Book remake currently in the works is being directed by Andy Serkis, and will, evidently, rely entirely on mo-cap.) Joining Murray in Favreau's version are Christopher Walken (as King Louie); Ben Kingsley (as Bagheera); Idris Elba (as Shere Khan); Scarlet Johansson (as Kaa); Lupita Nyong'o (as Raksha, the mother wolf); and Giancarlo Esposito (as Akila, the wolfpack leader) – all of which strike us as damn excellent choices. The film is slated for an October 9th release.